Traffic is changing at Juneau International (JNU), and so is the airport's emergency response program. As the airfield begins to receive an increasing number of larger-capacity aircraft, officials are enhancing its aircraft rescue and firefighting (ARFF) capabilities accordingly. Last year, the Alaska airport purchased a $750,000 state-of-the-art ARFF vehicle that is so tall and wide, JNU needed a larger station to house it. The recent $2.6 million renovation project also brought its facility up to FAA specifications and added more room for gear and support functions. In years past, fewer large-capacity planes-Boeing 737-800s, for example - landed at JNU's sole 8,857-foot runway. "It's difficult to get in and out of Juneau because of the weather and terrain," explains Airport Manager Patty Wahto. "In fact, many airlines used to over-fly Juneau when the weather was bad; and it's bad a lot of the time. Plus, we're located in a narrow corridor with mountains on both sides." Given the volume and nature of its usual traffic, JNU historically only needed two ARFF vehicles, with a total water capacity of 1,500 gallons, to satisfy associated FAA safety requirements. The advent of more sophisticated aircraft instrumentation, however, is making it safer to land during inclement weather. The specific technology helping more aircraft land at JNU was developed by Alaska Airlines in conjunction with the FAA. "They used Juneau as their test bed," Wahto notes. "We're the birthplace of commercial required-navigation procedures (RNPs)." Because JNU now handles more than five daily departures of larger aircraft (it currently averages 22 such departures), FAA consequently increased its airport index for firefighting capabilities. For example, now its vehicles must be able to carry 3,000 gallons of water. Although the airport's two existing ARFF vehicles met that requirement by carrying 1,500 gallons of water each, JNU officials felt that was an uncomfortably thin margin of error. "If one truck goes down, we don't meet the standard," Wahto explains. "By adding one truck, we now have a safety net." FAA covered 93.75% of the bill for the additional vehicle, and JNU funded the balance. FAA also paid 93.75% of the facility remodeling costs; the state of Alaska and city/borough of Juneau chipped in $81,000 each; and JNU funded the remaining portion. Despite recent changes in its traffic profile, most of JNU's approximately 100,000 annual flight operations involve air taxi/regional commuter aircraft. The airport also accommodates a much smaller number of general aviation and private aircraft. The airport's new ARFF vehicle is a futuristic-looking Panther, made by Rosenbauer America. Think high-tech emergency vehicle wrapped inside the body of the Batmobile, and you get the idea. It's 39 feet long, 11 feet wide and 12 feet tall, with enough capacity to carry 3,000 gallons of water, 500 pounds of dry firefighting chemical (potassium bicarbonate) and 400 gallons of aqueous film-forming foam. Although the six-wheel-drive Panther weighs almost 43 tons fully loaded, it can accelerate from 0 to 50 miles per hour in less than 35 seconds, courtesy of a 14-liter, 720-horsepower diesel engine. Top speed is 70 miles per hour, notes Marty Huffman, Rosenbauer America's western regional manager for ARFF equipment. "These vehicles have to be able to carry everything needed to fight a fire...you can't rely on a fire hydrant being near an airplane crash," says Huffman, who served on ARFF crews in the U.S. Air Force and at Tucson International for more than 20 years. "It's designed for high-speed, rapid response," he continues. "That's what makes these trucks so unique. They're designed to respond rapidly, [so crews can] get control of fires and create life-saving paths for people. If there's a fire on a runway, [passengers and crew] conceivably have 90 to 120 seconds to get off the aircraft before fire gets inside the airplane...and starts to eat away at the aircraft. As such, [ARFF teams] have a matter of seconds to get that agent-foam or chemical-down on an aircraft. That's why these trucks have such speed, power and extinguishing capabilities." The truck is also equipped with full-time, all-wheel drive for off-road duty. "It has to be capable of traveling off-road at speeds of up to 30 mph and still be controllable," he notes. The Panther is designed to optimize operator efficiency. For starters, one person can drive the vehicle and operate the firefighting controls. Everything can be done from the cab, including chemical application via a remote-controlled turret, adds Huffman. "When dealing with aircraft fires, the amount of dry chemical dispersed is critical," he emphasizes. "The Panther can discharge anywhere from 600 to 1,200 gallons per minute of foam and water." Inside the cab, video monitors and specially designed mirrors allow the operator to see what's going on outside the truck without wasting precious seconds exiting and reentering the vehicle. Controls are centrally located, and most have been simplified to push-button operation. The keypad-like panel allows operators to focus more on firefighting than on trying to hit the right switch or lever, says Huffman. "There's no more shifting gears to get into pump mode," he explains. "If the operator needs lights, it's one button. Foam? One button. That helps keep the operator's head up and out of the controls, so he can look at the fire, which is what the operator should be doing." 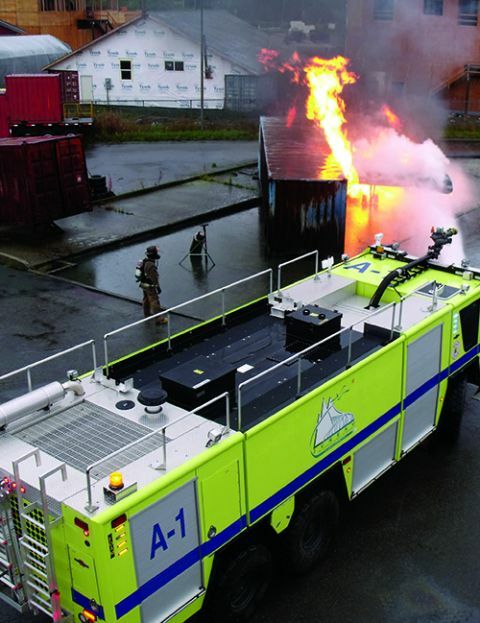 Like other Rosenbauer customers, JNU received a week-long training course when its new Panther was delivered. Company trainers familiarize drivers/operators with basics such as filling and driving the vehicle and operating its controls. More extensive training is then provided by the local airport or fire department that handles firefighting operations. According to Huffman, experienced drivers usually get the hang of a new ARFF truck in about a week, but it can take rookies a good six months to get fully acclimated. "These vehicles are really, really heavy and really, really fast," he comments. "It's not like driving your mom's Buick." The new Panther joined the airport's existing ARFF fleet-two older Oshkosh trucks-in 2016. The airport's newly expanded and remodeled facility was completed this July. JNU contracts out firefighting services to the city of Juneau's Capital City Fire/Rescue Department, so the facility is split into two sections, one devoted to airside firefighting operations and the other to serving the city's central borough. The airside operation is known as the Glacier Station, because it overlooks the Mendenhall Glacier. Previously, the station's airside section could only accommodate two ARFF vehicles. To add room for the airport's new Panther, crews tore down the airside portion and built a new structure that is 3 feet taller, with about 1,000 more square feet of space. Now, the airside section measures 93 by 56 feet. "We previously had four skinny bays that did not meet FAA specs for the vehicles we had and could not house larger trucks," explains Wahto. "Now, we have three larger bays, plus room to accommodate bunker gear, lockers and support functions, such as a decontamination room and a washer and dryer for bunker gear." Together, the remodeled facility and new ARFF vehicle position JNU to provide comprehensive, fast and efficient response to aircraft emergencies, she notes. "To maintain our FAA certification, we're required to have ARFF station ready-response," Wahto explains. "We're open 24/7, so having the right building, equipment and staffing available is critical. "We're also a diversion airport for medical or mechanical emergencies because there's no other airport nearby that's open 24/7," she notes. "We're a small airport, but we're still an important one." 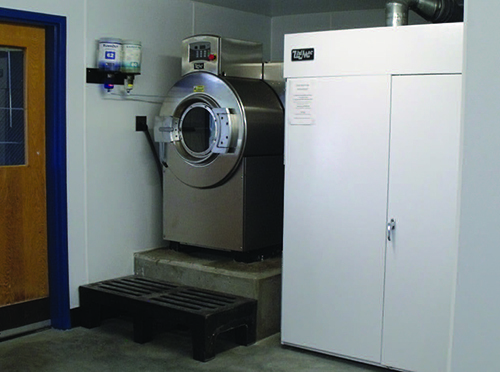 The new station includes a decontamination shower and facilities to launder staff gear.